Please note that this version of my Celtic Dragon design is the nearly the same as my original classic Dragon Medallion ($150). The differences are liosted here, though they are difficul;t to see in the photo which I took at an angle to show the subtle curvature of this version as a contoured or domed style. The general size is still the same, as a larger medallion as described below except that this one is a bit lighter weight and the bale at the top is reduced in size to not require such a bulky chain, as is needed on the other medallioin. You can still get a larger 4.5mm chain through this bale, so is fine on all but the most robust chains over 4.5mm. 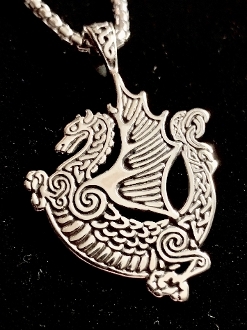 Celtic Dragon, an original design with ancient symbolism. In most ancient cultures, including the celtic tradtion, dragons and serpent/beasts were associated with the Earth as guardians and protectors. Dragons in those times were benevolent unless the energy of the Earth was in peril. I wanted to convey this energy, and hopefully brought this non threatening talisman to life with this representation. This design was developed and crafted as an artistic challenge to use all forms of celtic art on one design. These forms include: knotwork, spirals, key patterns and natural form. Is it possible that the Dragon has awakened in these modern times and within us to defend our beloved planet? As far as our awareness as humans is concerned, may it be so! This size design at around 2" tall, is a powerful size for the design, and expresses bold lineweight. I am glad to finally offer this extra large size of this design which is decidedly for those interested in a stonger and heavier format for larger chain types.